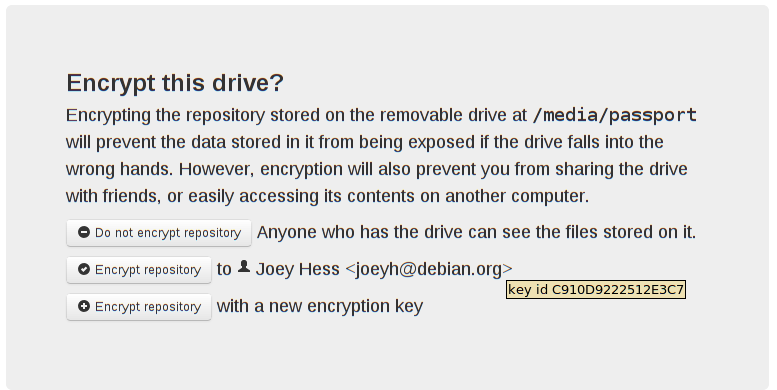 Now the webapp can set up encrypted repositories on removable drives. This UI needs some work, and the button to create a new key is not wired up. Also if you have no gpg agent installed, there will be lots of password prompts at the console. Forked git-remote-gcrypt to fix a bug. Hopefully my patch will be merged; for now I recommend installing my worked version. Today's work was sponsored by Romain Lenglet.